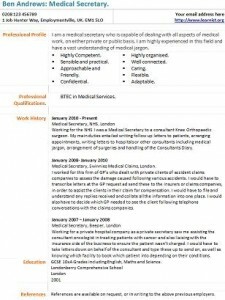 Medical Secretary CV example and template. Amend as suitable and create your own CV in seconds. Have you ever thought about working as a Medical Secretary? Medical Secretary vacancies can be found on the job sites online. All you need to do is to visit those job boards and start searching for the latest positions. If you want to become a Medical Secretary you should know that employers prefer those who can type fast and accurate and have computer skills. I am a medical secretary who is capable of dealing with all aspects of medical work, on either private or public basis. I am highly experienced in this field and have a vast understanding of medical jargon. Working for the NHS I was a Medical Secretary to a consultant Knee Orthopaedic surgeon. My main duties entailed writing follow up letters to patients, arranging appointments, writing letters to hospitals or other consultants including medical jargon, arrangement of surgeries and handling of the Consultants Diary. Medical Secretary, Swinnies Medical Claims, London. I worked for this firm of GP’s who dealt with private clients of accident claims companies to assess the damage caused following various accidents. I would have to transcribe letters at the GP request ad send these to the insurers or claims companies, in order to assist the clients in their claim for compensation. I would have to file and understand any replies received and collate all the information into one place. I would also have to decide which GP needed to see the client following telephone conversations with the claims companies. Working for a private hospital company as a private secretary saw me assisting the consultant oncologist in treating patients with cancer and also liaising with the insurance side of the business to ensure the patient wasn’t charged. I would have to take letters down on behalf of the consultant and type these up to send on, as well as knowing which facility to book which patient into depending on their conditions.